I don't think I ever could have imagined that, as first lady, I would appear in an episode of Billy on the Street to promote fruits and vegetables and would wind up slow dancing with Big Bird in a supermarket while Billy Eichner serenaded us with an Aerosmith song. But then again, six years ago, I don't think any of us could have imagined that Fenway Park would have a 5,000-square-foot farm on its rooftop to provide fresh produce for its fans; or that 50 million Americans would visit a government website called ChooseMyPlate to learn about healthy eating; or that sales of kale would jump 50 percent in just four years; or that 1.6 million kids would be in healthy daycares, eating more than 225 million healthy snacks and meals a year; or that more than 30 million kids would be eating healthier school breakfasts and lunches every day; or that the first unanimously chosen NBA MVP, Steph Curry, would choose fruits, vegetables and water as his primary product endorsements. In 2010, when I first launched Let's Move!—a nationwide effort to address our childhood obesity epidemic and raise a healthier generation—the challenge was so big and entrenched that this kind of transformation in how we live and eat seemed nearly impossible. Nonetheless, we were still determined to make a difference, so we engaged leaders from all sectors—educators, medical professionals, elected officials, parents and even kids themselves—to create public-private partnerships and science-based policy to improve access to healthy food. But we also knew we would need to get kids excited about eating that food and inform and empower parents to purchase and prepare that food for their families. And that meant meeting people where they are with fresh, interactive approaches and relevant, inspiring messages. 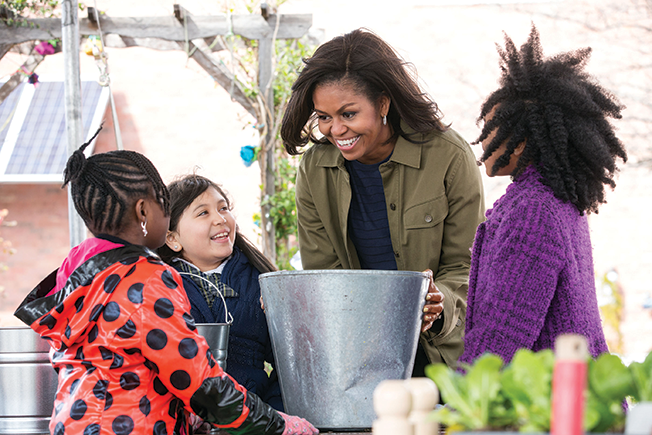 We started by planting a vegetable garden on the White House lawn with local students to help kick off a national conversation around how we eat and where our food comes from. And since then, we've employed just about every medium imaginable to try to cut through the noise and engage kids and families directly—from Vine Q&As that brought about Turnip for What, to appearing on Disney's Doc McStuffins in cartoon form, to Mom Dancing with Jimmy Fallon (twice). We've also worked to use the power of advertising to our favor, which is no easy task when of the nearly $2 billion spent annually on advertising food to youth, less than 1 percent is spent on marketing fruits and vegetables (which, according to current nutrition guidelines, are supposed to fill half our plate at each meal). But we all know that advertising works, so we figured, why shouldn't fruits and vegetables get in on the action? That's the idea behind Partnership for a Healthier America's iconic FNV marketing campaign for millennials that utilizes celebrities like Steph Curry, Jessica Alba, Cam Newton and dozens of others in smart, funny ads for fruits and vegetables. In just the past year, FNV has drawn 1 billion media impressions, and 70 percent of people who saw the campaign said they ate more produce as a result. The same idea underlies a campaign by the Produce Marketing Association (PMA) called "eat brighter!" through which Sesame Workshop is allowing PMA to use Sesame Street characters, without a licensing fee, to promote fruits and vegetables in 29,000 grocery stores (think Elmo stickers on apples). Thanks to our favorite furry friends, PMA reported an increase in fruit and vegetable sales among campaign participants nationwide. Once we got people excited about healthy eating, we knew we would also have to improve how nutrition information is communicated to help folks actually buy and serve those healthy foods to their families. That's why we launched MyPlate—an icon that replaced the old food pyramid and provides clear guidance for how to put together a healthy meal. In addition, for the first time in 20 years, the FDA just finalized a new and improved Nutrition Facts label—with more realistic serving sizes, bigger font to showcase the calorie count and information about how much sugar was added during processing and how much comes from ingredients like fruit—that will soon be on nearly 800,000 food products nationwide. So today, from the time our kids are barely old enough to talk, so many of them are hearing a new set of messages and being exposed to a new set of options around healthy eating. As a result, they're developing a set of habits and preferences that will set them on a healthy path for the rest of their lives. But as much as we've accomplished, we are only just getting started. While it's true that childhood obesity rates have stopped rising for the first time in decades, and rates are dropping for our youngest kids, we haven't yet achieved the ultimate change we seek, which is to end our childhood obesity epidemic and raise a healthier generation. That's why I intend to keep working on this issue not just during my remaining time as first lady, but for the rest of my life. And I'm confident that if we keep working together, and being even more creative and innovative about how we market healthy food to our kids, then we can solve this problem and give all our children the bright futures they so richly deserve. 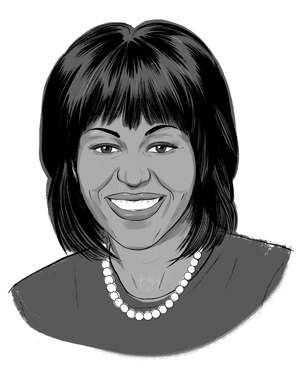 Michelle Obama (@FLOTUS) is the first lady of the United States of America and founder of Let's Move! She has been at the forefront of the push for a healthier and more active generation of Americans.